For a little background, the Google Pixel Slate was announced at Made by Google 2018. After almost two months, it finally launched in late November. We reviewed it around that time. As we mentioned in that review (and this applied to literally every review of the Pixel Slate that was done at the mercy of Google’s PR team), the device we got to try out was the i5 model — the model which has a starting price of $1,000. Anyone paying attention to Google’s announcement in October, though, knew that $1,000 was very much not the entry-level price for the Pixel Slate. The tablet was supposed to be available from $599, which, notably, is nearly half the price of the device that was widely reviewed by blogs like us. It was around that time that we considered just buying one ourselves, but that brought another problem: it was “out of stock”. And it has been “out of stock” since not long after launch. Some people managed to pre-order the $599 Celeron Pixel Slate and actually obtained one (even some popular reviewers got them and gave them a look on their channels), but it wasn’t long after that Google just ran out of them… or something. I say “or something” because this whole situation is awfully suspect — not necessarily of any objective “wrongdoing,” but perhaps that there is something going on here that is more than just “low stock.” It’s been four months, and the stock status hasn’t budged. We all know that the Google Pixel Slate isn’t exactly the hottest product Google has launched. Reviews have generally been lukewarm-to-negative. So it’s almost definitely not a matter of demand, and if it’s a matter of supply, that supply must have been extremely thin. 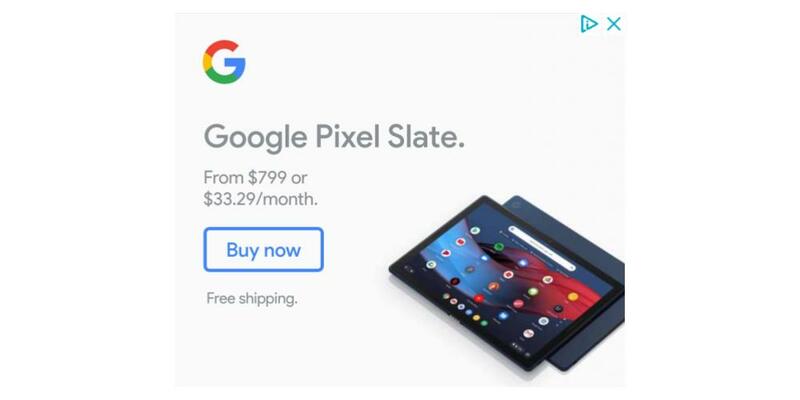 Add to that a recent ad that we spotted on our own site for the Pixel Slate, which shows no mention of the device’s original $599 entry-level price point. Instead, matching the “out of stock” status at the Google Store itself, it advertises the $799 price point for the M3 model. That’s not an issue one way or another, but if the marketing team at Google is changing their ad copy to reflect this $799 price, Google must really not have any plans of the $599 Slate coming back anytime soon. As usual, the question is “why?”. Is it because reviews of the lesser-powered Celeron-based Pixel Slate have been even more negative than the already-generally-negative reviews of the $1,000 model? I mean, Marques Brownlee managed to get his hands on a $599 Pixel Slate for a review on his channel (presumably in the tiny window they were available) and wrote this in his video description: “Don’t spend $600 on the Celeron Google Pixel Slate. Just don’t do it.” Brutal. Is it profit margins? Has Google decided this underpowered version just isn’t worth selling, especially if it’s a subpar experience? Do they have data showing that people just weren’t interested in this cheapest model from the get-go? Given that this model was exclusive to the Google Store from the beginning, was the strategy always to just sell a very limited number of these so that Google could tout a lower entry-level price than was true? The truth is, we just don’t have any idea why it’s not available nor if it ever will be again. Google told us in January that it didn’t have an “estimate of when they will be available for purchase again.” When we asked again before writing this piece, they pointed us to their previous answer and maintained that they’re simply out of stock. The company says it still intends to one day sell more of the $599 and $699 models, but will it? Admittedly, it doesn’t seem like it matters much, since apparently only a blog called 9to5Google cares enough about the Pixel Slate to even bring this up. And as mentioned, the $599 Pixel Slate was seemingly never meant to be the focus in the first place. It’s been a Google Store “exclusive” (as far as you can say that given that it’s barely been available) since day one. Third-party retailers like Amazon and Best Buy do indeed sell the Pixel Slate, but they have offered only the m3 (starting at $799), i5 (starting at $999), and i7 (starting at $1,599) variants. But there are certainly some people out there who want to buy a Pixel Slate, but want this $599 model, right? As I’ve written already, the device does indeed serve its purpose best as a productivity Chromebook rather than a gaming/media tablet, so a Celeron isn’t all too underpowered or uncommon for that use case. Also, it’s a bit weird for a multi-billion dollar tech company that wants to be taken seriously in hardware announce a product and then just… not sell it. Right? PS: This post was written on a Pixel Slate that I quite enjoy… as a Chromebook. And for that use case, the i5 processor that’s inside mine is a bit overpowered. Celeron would be just fine. Google Pixel Slate is the first Chrome OS tablet from Google.